Kaisho means the charter. The lines are written one after another. The lines are written distinctly, confidently. The hieroglyphs are precise, angular, square under the form. Gyosho – semi-italics. Faster writing. Lines are smooth, rounded off. Sosho – italics. A prompt writing in few movements. Lines are fast, flying. In the basis of Japan’s calligraphical styles is concept that the written text should give aesthetic pleasure. The visual perception of the text does not concede to perception of pictures and plays the important role in understanding of sense. 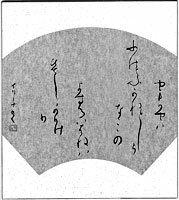 Poetic collections have been written by thin, vertical, extended line of cursive writing Kana. Today this graceful style of the writing is used for record of ancient songs and verses. It represents aesthetic pleasure to a greater extent than a way of information transfer. Not everyone Japanese today can read such verses, not everyone calligrapher can write by this style, but everyone is capable to estimate beauty of the refined elegant lines.